Sanjay Parthasarathy, a defense contracting industry veteran, has joined LMI as a senior vice president and chief technology officer. 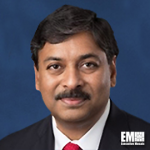 Parthasarathy will oversee the Tysons, Va.-based nonprofit government consulting services contractor’s strategic investments and innovation efforts and help revitalize the LMI Research Institute as part of his appointment to the newly created role, LMI said Wednesday. He is a finance and strategy professional who held executive positions at several defense contractors such as Raytheon (NYSE: RTN), Harris (NYSE: HRS) and Cobham’s advanced electronic solutions business. The creation of the CTO role is part of LMI’s reorganization effort that seeks to align the business with national security, defense and health markets and facilitate the delivery of digital, analytics, management advisory and logistics services to federal government clients. “This transformation is a direct result of the feedback from our consultants gathered during my first 90 days at LMI,” said Dave Zolet, LMI president and CEO. “LMI needs to focus on our core capabilities, while innovating to lead our customers on their digital government journey,” Zolet added.